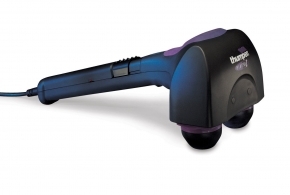 The Mini Pro 2 is a professional massager that has been designed for patient or self-care. Using patented Thumper Actions, the Mini Pro 2 was designed for those hard to reach places like the shoulders and mid back. Two anatomically designed massage spheres penetrate 6mm into the tissue. Adjustable speed from 20 to 40 times a second produces deep penetrating waves to release muscular tension. A great complement to the Maxi Pro or by itself.